He has risen, indeed – just as He said! Hope you and yours are enjoying a very nice and blessed Easter. Our weather couldn’t be much nicer – sunny, clear (a tiny bit of rain this morning – but that doesn’t count) and perfect for Spring! I have spent parts of the past two days with close friends, working arm-in-arm in our church kitchen. Saturday was food prep for the Easter Sunday breakfast – as in years past I’ve had a great time working with friends – like before, I washed, cut & arranged fruit skewers and, for the first time, helped crack 15 dozen eggs! Work is always made much lighter when working along side friends – lots of laughter, smiles, some teasing and above all – FUN! This morning was more of the same – for the first time (in the years doing this) I mixed large batches of pancake batter – LOTS of it! We were using the commercial mixes where you just add water and stir – and stir, and stir and STIR!!! Someone thought it would be a good idea to pour the batter into large water pitchers, making it easy to pour onto the griddles, so that’s what we did. Little did we know, the batter, once mixed – would RISE! I came back a little while later to see that the batter in the pitchers was OVERFLOWING! YIKES – back to the drawing boards – water it down a bit and keep going. I’m pretty sure no one went away from the breakfast hungry – there were pancakes left over AND pancake batter. After the service I came back into the kitchen and discovered there was still a half-ful large bowl of batter, so I poured it into a gallon zip-lock bag and brought it home. We had pancakes & eggs for lunch (with about 6 very big pancakes still leftover) – sort of like the Loaves & the Fishes – it fed many! I took a break this afternoon and just napped – I’d earned it. Later this evening we’re having H.M. Pizza – (home made) but my guys call it: “Her Majesty’s Pizza” (see, bet you didn’t know I had a TITLE!) We will be having Easter dinner on Monday evening – first to allow me to get a little rest and second to also allow my oldest son and his family to join us. (He’s an executive chef and his off day is Monday). One of my guys got up this morning and said: “What? The Easter bunny didn’t visit our house?” (I’d totally forgotten to get out the baskets and fill them! Yes, even at their ‘advanced’ ages of 18, 24 & 30, they still get candy in their baskets!) Will have to remember to do that pretty soon here, as youngest gets off work at 8:30 p.m. I still have yet to see our Michigan sign of Spring: the Robin – although many people tell me they’ve arrived from down South. Looking out my kitchen window you can see the bright little crocus blooms. I love the way those flowers ONLY open when it’s sunny – the minute the sun starts going down, they close up. Soon there will be tulips, daffodils, narcisus and hyacinth – Spring is FINALLY here! Hoping you and your loved ones are celebrating a very lovely day. 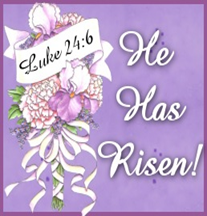 Praise GOD – HE ROSE! He lives so that we, too, may live. Hallelujah, what a Savior! Lay eggs in a single layer in large saucepan. Cover with cold water by at least an inch. Slice French bread into 20 slices, 1 inch each. baking pan in TWO rows, overlapping slices. Topping and spread evenly over bread. golden brown. Serve with maple syrup. & gently remove. Cool cakes completely. top & sides of cake. Sprinkle with remaining nuts. 2 tsp. ground cinnamon to yellow cake mix. ingredients, stirring just until moistened. 1 to 1 1/2 tsp. topping on each muffin . 2/3 C. water, room temp. to remaining frosting; beat until blended. from pan. Top with frosting. here). Cook, stirring until heated through, 3-5 minutes. Heat broth & onion in large saucepan. is tender. Add carrot, celery & parsley. side down, on unheated rack of a broiler pan. the last 5 minutes of cooking. meat. Refrigerate 30 minutes to marinate. uncovering for the last 15 minutes. dish, stir to evenly coat beef with dressing. ingredients to crockpot; cover with lid. hours. Stir in 2 T. flour mixed with 2 T.
brown ground beef & garlic; drain. Add tomato sauce; simmer 15 minutes. 35 minutes. Makes about 4 servings. Here’s a recipe I tasted last Sunday in Sunday School – very nice flavor – not too sweet, just perfect! Am thinking of making this for our Easter dinner ‘dessert’ – it’s light and not sweet; perfect ‘ending’! extract and enough milk to achieve desired consistency. Drizzle over warm coffee cake. Makes 16-20 servings. NOTE: You can vary pie fillings for a different taste! Today is also Good Friday – when we remember the ‘PRICE’ Christ payed for our sins on the cross. It is a sad remembrance but also it is called GOOD Friday to remember that He did not STAY dead – He conquered Death & Hell for US – for all who would come to Him for forgiveness and to have eternal life with Him when we die. DO YOU BELIEVE THIS? If you are able to read these words – there is STILL TIME! Now begins the Easter celebration of the life, death, burial and resurrection of our Lord Jesus, Christ. There is no more perfect a time to ask Him into your heart. He MADE you, He LOVES you and He FORGIVES you. Today it’s a ‘balmy’ 33 degrees out – clear with light, fluffy clouds in the sky; somewhat sunny BUT that lovely 33 degrees, with the accompanying winds FEELS like about 20! BRRRR! Just got home from going grocery shopping and getting gas (don’t know about you, but sometimes I wish there was a better way to get gas – like maybe the way it was when I was young – where someone ELSE pumped it FOR you! Then you could sit in your nice, warm car and not freeze or have your gloves end up stinking of gasoline! But I digress . . .) I was suprised that the roads were REALLY clear today – very few cars out! Youngest is still driving to work each day – doing better, by the way. Tonight is his last ‘drive’ and it’s a Night drive ON THE EXPRESSWAY – he’s a bit excited/worried/scared/etc. – I don’t blame him! I’m sure (baring any complications tonight) he’ll pass the class. Not much going on around here – had a small bout of stomach problems (not flu, just upset stomach and the other complications); I’m feeling stronger today – YAY! Still haven’t solidified Easter dinner plans with my oldest son; he’s stopping by tonight to (FINALLY) pick up his birthday present (birthday was 3/13!). Tonight’s special needs group, Thurs. babysit grandson, Friday going to Good Friday church service 7 p.m. then choir practice afterwards 8?-9:30/10. Saturday is the food prep for the Easter Breakfast, then Sunday is the ‘get up super early, get to church by around 7:15, work on breakfast food/serve/check on food levels to make sure all trays/containers are relatively full, then gulp food & run to choir room to sing the Cantata at 10 a.m.! I’ve been REALLY conserving my energies because I know that, even though it’s been over a year since the radiation, I still don’t have a lot of energy and I really have to work to conserve what I have or I’ll end up a quivering puddle of goo on Easter Sunday . . . not a pretty sight! Been working on more of the ‘scrap-ends’ baby hats; it’s kind of fun to see what colors to combine to make one. Today’s is a white brim with a small light magenta stripe in the middle; the main hat is medium lavender & white stripes. RECIPES! Lots of them! In fact, I had to stop typing them up last night as I was just plain getting too tired; lots of companies putting out some really great sounding recipes – all for YOU!!! & cut 3 inch circles, using a scalloped cookie cutter. & mixture thickens slightly. Do NOT allow to boil. Remove from heat, transfer to a bowl & cool. Pour filling into dough cups; bake 15-18 minutes. of 140 degrees F., about 20 minutes more. sausage. Cover & refrigerate until morning. & crust is set. Serve with maple syrup. until light & fluffy. Beat in egg & vanilla. lightly browned. Remove to wire racks to cool. Cut sour cream into biscuit mix; add 7-Up. pan; bake 12-15 minutes or until golden brown. cooking spray. Sprinkle with pepper. minutes or until done (145 degrees F.). dressing. Top with cheese & bacon. minutes. Stir in peas, tomatoes, garlic & pepper. bacon and add 1/2 to bowl. Add 1 C.
It’s a clear, and sometimes very sunny day here – currently 28 degrees. We’ve had various light, fluffy snowfalls these past few days, but fortunately for us, none has remained stuck to the ground/cars/ roofs, etc.! Middle son had his second ‘Drive’ with his Driver’s Ed instructor and they went out to Clarkston (near our church). He said it went MUCH better as it was during the day and he could see where he was going. (First drive was at night during a freak hail storm – it made the roads wet and he couldn’t see the lines very well). He informed me, after talking to his instructor, that he really didn’t even HAVE to take this course because he’s 18 and he passed the 50 question test and got his Permit. He told the teacher that he WANTED to take it (I’m GLAD, because I couldn’t imagine him driving on the roads with NO training at all!) Weird, the way our state has changed their rules for getting a beginner’s license! Been plowing through another murder mystery (author’s new to me): “The Last Templar” by Raymond Khouri. It’s a fast read (I’m 3/4 done, started it yesterday). I don’t think I’ve ever read this author before, but he writes a fast-paced, interesting premise. Separate pizza dough into small bite sized pieces. In a bowl add your favorite flavored dipping oil. Toss dough pieces in dipping oil to lightly coat. with final layer of dough pieces. with optional marinara dipping sauce on the side. You can serve it hot or room temperature. ring on top. Add a cherry in the middle of each pineapple. Pour cake mixture over to fill muffin tin 3/4 of the way full. minced onion, and pepper in Crockpot . cream cheese. Cook another 30 minutes. Serve with bacon and cheddar on top. pie plate with points toward the center. stir in asparagus mixture. Pour into crust. minutes before cutting. Makes 8 servings. Toss greens with next 4 ingredients in large bowl. Spread nuts in single layer on rimmed baking sheet. covered, 1 minute. Serves 6.
of 9 X 13 baking pan. Bake 10 minutes. sugar & cinnamon in large bowl with elec. 4 hours. Serve topped with Cool Whip. cheesecake. Bake 5 minutes. Cool completely. Refrigerate 4 hours. Refrigerate leftovers. Toss green beans, onion, garlic & 2 T.
wire whisk. Stir in parsley. then drizzle with lemon mixture. white, milk, horseradish, 1/4 tsp. salt & 1/8 tsp. Blend together mashed potatoes & sugar. mixture over peaks of candy; let cool. 2 C. chopped pecans to candy before shaping. Had a good time yesterday babysitting my 6 1/2 yr old grandson. He asked me if I would ‘read’ with him for 30 minutes. He chose the books and I was pretty surprised at the extent of his reading vocabulary. He announced he’s now in the 3rd grade group for Spelling (he’s only in First Grade!) He said there’s one other student with him in that group. (His dad was really good at spelling & reading, too). Well, friends – it’s time I get off of this machine and go DO SOMETHING CONSTRUCTIVE (as my husband would say). We just got in touch with our income tax preparer – I was really getting worried: I’d called and left two messages on his machine, and each time it went directly to his machine. Finally, today, made one more attempt at calling and GOT HIM! It seems he was having some sort of medical problem (he was with a client, so couldn’t elaborate) – I was just glad to HEAR his voice! He’s been doing our taxes since the second year we were married (that would be 1977) and we’ve become great friends – seen each other’s kids grow up, he’s watched us with all of the various foster children, etc. Just glad to hear he’s OK! FIRST DAY OF SPRING! YAY!!! I don’t know about you, but Spring is my very FAVORITE time of year! I love looking forward to warmer weather, seeing & hearing the returning birds, looking for those green shoots & buds popping up – it’s SO exciting! Today, here in good old COLD Michigan, it’s a brisk 25 degrees, but it’s clear and there’s an occasional burst of sunshine to cheer us. I’ve had fun wishing those I came in contact with at the library and grocery store a “Happy first day of Spring! and listening to the (mostly) grumbles. I guess you’d say I’m one of those “glass half full” people – I’m always trying to find SOME good in any situation. Nothing much going on ‘special’ for the next few days (at least, that I know of). Went to KMart to see if they had any marked-down ladies winter hats, as the one I have is looking a bit well-for-wear. Found a nice cream colored, VERY soft set, hat, gloves & scarf for $5.99 – bought it only to find the hat is a bit too small – oh well, it will make a nice gift for someone else! Also ‘treated’ my husband to two Easter gifts: “The Hobbit” on DVD and a toaster oven. He’s been commenting lately that he used to love using a toaster oven (when he lived with his parents – that’s a good 40 years ago . . .sigh). Well, it just so happens that KMart had this lovely unit that’s both a toaster AND a broiler/oven. The top has an opening for toasting (big enough for 2 bagels!) and the front is a broiler. Husband was surprised (but grumbled he didn’t know where we’d put it) – I found a place, just moved other ‘stuff’ over on the counter (read: George Forman grill & elec. can opener). ‘Gifted’ the old toaster to middle son for when (if ever) he decides to move out, again. It’s a win/win situation, as I see it. Oh! AND the new oven is also in a bright, sassy shade of red! My kitchen is nothing to look at (read: not a particular color theme here, unless you count the appliances are a lovely shade of 1970’s ALMOND! Can’t tell that’s DATED, eh?!!!) We’ll see how this all works out. Cover with remaining Cool Whip. 2 hours or more before serving. skillet on medium-high heat; add meat. frequently. Add onions, cook & stir 1 minute. frequently. Serve over hot, cooked rice. to soy sauce mixture before cooking. Dutch oven; cover with water & bring to boil. heat source 3-4 minutes or until beef is glazed. butter is melted. Drizzle over cabbage & potatoes. stirring occasionally. Add cabbage & broth; stir. all remaining ingredients; mix lightly. or sunflower seeds to salad before refrigerating. bag; use to pipe filling into egg white halves. of toppings (see below). Makes 24 egg halves. potato slice, overlapping ends under potato. with pepper. Makes 4 servings. in small bowl. Gradually stir in milk. biscuit cutter dusted with Bisquick. crescent rolls in bottom of pan, smooth edges. little sugar. Bake 25 minutes. Brown roast in large skillet using oil. for 6-8 hours or until tender. This past two days have given me ‘food for thought’ – more specifically, reasons to realize I’m very blessed. Yesterday, while just sitting at a red light minding my own business, someone behind me hit my car VERY hard! Fortunately, neither I nor my car were injured at all – THANK YOU, LORD! Shook me up a bit and scared me, but I’m fine. Today while driving youngest to work we saw up ahead LOTS of fire trucks, police cars & red flashing lights. Not exactly sure how it ‘went’ but there was a medium-sized car with it’s front end REALLY smashed in (ie: engine might have been in drivers seat, that’s how far it got moved) – medium pick up truck on it’s side with it’s top cab really smashed in (ie: probably rolled). I can’t imagine just how that accident occurred, judging by the extent of damage both vehicles occurred. The speed limit on that section of road is 45 MPH. (This is about 2 blocks from my house – remember I live on a MAJOR road).This accident made me realize just how much I am watched over and protected – that accident could have been me. (Yes, I’ll give you that perhaps I’m exaggerating some here, but life is SHORT! I thank the Lord my car encounter was very minor. I’m not sure if either of the drivers in the above mentioned accident came out alive. Very scary stuff. Be careful when you’re out on the roads, please. I wondered to myself how that affected youngest son who’s going through Drivers Ed. classes. He told me this morning that next week he will be driving on the roads Mon-Thurs. with his teacher. Thursday is their last day – boy, that time went by fast! Take care of yourselves, remember to smile/relax a little/and be CAREFUL when you’re out driving. You are valuable to others! Hope you had a nice, relaxing weekend – for a change, I did! Although our weather insists on remaining in the cold zones (30’s), we’ve been blessed (so far) with no new snow. Today was a dark, dreary day with light, misty rain and lots of wind – not fun if you had to be out in it (which I did). Got the grocery shopping done and came back home to relax a bit before starting dinner. Not sure right now if that’s going to be beef cube steak or Shepeherd’s pie – I’ll figure that one out later when I come to it! Not much new to write about this week (so far, that is) – gas prices are staying at $3.76/9 for the cheapest (at Clark gas stations). Tomorrow night is Knit night – same/same there. Weds. special needs group – regular lesson night. Thurs. babysit grandson and Friday open (so far – YAY!). This is week Two of youngest son’s driving lessons and tonight, after class, will be his second ‘behind the wheel’ experience but THIS TIME the teacher is having him drive on real roads with REAL CARS! (Last time he drove him to a small neighborhood and had him wend his way around – no actual moving obstacles (he did fine). I haven’t taken him out since our first experience a little over a week ago. His teacher seems very patient and I’m glad he has his lessons AT NIGHT – less chance of problems AND more experience driving at night, which is never easy when you first are learning to drive. Recipes – got LOTS of them for you! casserole, add sliced almonds , if desired. grate reserved potatoes; stir them into mashed potatoes. serving dish & serve with applesauce & sour cream. bowl, combine eggs, milk, mustard, salt & pepper. 1 medium onion, chopped (1/2 C.
In 4 qt. saucepna, heat oil over medium heat. occasionally, until no longer pink in center. will equal one breast half. You could also use frozen vegetables if you like. into center should come out clean. using elec. mixer until desired consistency. layers of meat mixture, sour cream & cheese. Stir together granulated sugar, cocoa & cinnamon. (50%) 30-60 seconds or until smooth when stirred. in remaining 1/4 C. butter; roll in cocoa-sugar mixture. good spirits – Spring is coming FAST . . . YAY! Slowing down some . . . Almost the end of this week and it’s FINALLY slowing down. Not that I still don’t have a few ‘commitments’ to do, but it’s nice to know that there aren’t many (Weds & Thurs. were crazy, just trying to keep up with what time and where I had to be, when). My dear husband volunteered to drive youngest to work today (10:45 a.m.) so that I could take a leisurely shower and not have to rush anywhere until I get to go out to lunch with two girlfriends at 1 p.m. – wasn’t that nice of him? These two friends & I have known each other since high school – one is a year older and used to ride the same bus as I did; the other one was in Girl’s Choir in high school with me – both are in my Sunday School class at church. We’re going to Leo’s Coney Island – good food, good selections and good prices – can’t beat that! Later on this evening (5:30) I have to help ‘do’ my special needs group Gym Night. My ‘partner/leader’ of the group has been sick with bronchitis so I ended up running our Wednesday night meeting. She says she’s feeling a little better, so she’s heading up Gym Night – we’re having sloppy joes. Gym Nights are fun for our ‘students’ – first we eat, then a short devotion then they are able to either just chat with their friends, work on jig saw puzzles, color coloring sheets, play basketball or several other floor games. Tonight one of the moms is coming to direct a few group games – they love that. Last time she had them sit in folding chairs divided by a batmitton net – they had to hit a blown-up balloon back & forth over the net until the balloon hit the floor (point for opposite team) – they LOVED it! These kinds of games are great because some of our students are in wheelchairs – this way, they can participate, too. Craft-wise, finished a few more baby hats. Went to the library to get more John Lescroart novels and discovered the Friends of the Library were having a used book sale (SCORE!). Found 2 Lescroart books and several other murder/mystery writers I like PLUS a paperback knitting book with a really cute baby sweater pattern (75 cents) – I couldn’t resist. The only ‘problem’ is – I’m not exactly sure I understand their way of constructing said sweater; Oh well . . . won’t be the first time I’ve tried to ‘create’ using someone else’s pattern! So – have you got any St. Patrick’s Day plans? I’m seeing more interesting recipes, but we our family doesn’t really do anything special (none of us are Irish, for starters . . . . YES, I know that MOST people who celebrate that day AREN’T, but I digress…) On to recipes! Crush 16 cookies; toss with butter. Press into an ungreased 9-in. square dish; set aside. In a large bowl, beat cream cheese, peanut butter & 1 C. confectioners’ sugar until smooth. Fold in half of Cool Whip; spread over crust. Sprinkle with peanut butter cups. In another large bowl, beat milk, pudding mix & remaining confectioners’ sugar on low speed for 2 minutes. Let stand for 2 minutes or until soft-set. Fold in remaining Colol Whip & spread over peanut butter cups. Crush remaining cookies; sprinkle over top. Cover and chill for at least 3 hours. pepper to meat. Break up tomatoes with spoon. sheet sprayed with nonstick spray, bake as directed. up to 1 week. Makes 1 Cup. Blend ingredients together, mixing well. loaf pans. Bake 50-60 minutes. minutes or until mixture is bubbly & hot. Weather-wise, it’s 33 degrees F., clear and a bit dreary – BUT no snow (or only in a few big huge mounds in parking lots where it had been plowed weeks earlier). Husband says we might be getting 1-2 inches tonight – hope not. Yes, 1-2 inches isn’t much, but add my special needs group and their parents/caregivers and it’s not a good mix – especially if you have to transport wheelchairs – they’re the ‘pits’ in any kind of snow – hard to push. Oh well – if it comes – it comes, right? Gas prices around here dropped 3 cents – to $3.76/9 a gallon (for cheapest gas). I’m going to need to fill up soon – this has been a week of traveling from our house to Clarkston (25 minutes), Auburn Hills (25 min. opposite direction), and points in between; have used up almost a full tank of gas this week (not my normal). Lunch today is in Clarkston, Gym Night is in Auburn Hills, so you get the idea. Oh! On the ‘Spring’ weather changing thing – I stepped out to our back yard yesterday and observed some green ‘flower bulb’ shoots attempting to come up (they will probably be daffodils, but could be crocus) and also spotted our BUNNY! Every year we have 1-2 rabbits who live in our raised garden/flower bed; we all try to spot them. This one was full-grown, brown with the white cotton tail. The one we had last year had a decided limp on one of his back legs – yesterday’s bunny was just fine – hopped vigorously away from me. I LOVE seeing the bunnies, the Spring flowers, hearing the birds returning – YAY, SPRING!!! Anyway, friends – hope you have a good day/evening. Stay warm, relax when you can and remember to try to do something YOU like, at least once a day. Oh! And SMILE a little – it’s good for the soul! What a change a day makes! Yesterday was a nice, sunny ‘in the 40’s’ day – almost typically Spring-like weather BUT upon waking today we’re now in mid 20’s with some snow on the ground and a rather biting wind blowing. Quite the change! (If you live in Michigan – it’s almost expected). We’ve had HUGE snowstorms on or around Easter here, so I’m just biding my time as to the weather coming (hope it will be mild). Yes, for me, it’s a busy week with lots of ‘scheduled’ things to do. Last night was our Knit group’s Movie night and I was happily surprised that three of our ladies who didn’t think they could make it, came. Lots of really yummy foods and they chose: “Chocolate” for the movie – always a good chick flick. I just got word that tonight I’ll be in charge of our special needs group: it’s Music/Birthday night and my partner/leader Lois is down with bronchitis (almost no voice). That will be an ‘interesting’ evening, but Music/Birthday night goes pretty fast: quick opening prayer, then lots of singing Christian songs, then quick prayer requests, then it’s cut the cake, serve it and it’s time to go home! Craft-wise, it’s back to knitting baby hats. A friend of mine from the Knit group sent me the directions for baby booties that are knit, then sewn up the back (MY kind of pattern! I don’t ‘do’ knitting with the 5 tiny needles – think of people you’ve seen knitting socks. Just ‘straight’ knitting then seaming is MY thing – works for me; I don’t mind sewing up seams. It’s funny how many of the ladies in my group really DO NOT like sewing seams of any kind, whether they be sewing up a sleeve seam for a sweater, or even sewing up hats; we’re all different. soda, salt, cinnamon & nutmeg; mix well. it carefully so it doesn’t burn). tender, stirring frequently. Add flour; mix well. until mixture boils & thickens, stirring constantly. occasionally. Add remaining ingredients; mix well. melted & soup is heated through, stirring constantly. 9 inch cake pans or one 9 X 13 pan. broth, water, barley, salt & pepper. Bring to a boil. butter to saucepan, melt on medium heat. parsley & peppercorns in large pot; cover with water. to the pot, cover & simmer until tender, about 30 minutes. 1 C. mashed potatoes, at room temp. Pour warm water into bowl of an elec. mixer fitted with dough hook attachment. potatoes, sugar & salt. Gradually mix in flour. (about 1 1/2 hours). Grease 2 loaf pans. each piece into loaf shape & place in greased pans. bottom of 9 inch square pan. Beat cream cheese in medium bowl until fluffy. Gradually add sugar, beating until well blended. Knowing this week will be busy, I thought I’d better post some Irish recipes before St. Patrick’s Day. Today is my oldest son’s 30th birthday – hard to believe! Hope you’re feeling well and thinking about Easter preparations or reflecting on what Easter means. Boy, that weekend sure flew by! Our weather here is certainly improving – we had temps in the 60’s yesterday!!! That’s a high so far – it was sunny & clear; in the afternoon I carried my coat to church (to wear at 7:15 p.m. when church got out, but sure didn’t need it at 4:30 for choir practice!). Went to the baby shower Saturday and had a nice time. Got to see two friends I hadn’t seen in a good 7 years, maybe more. Was a bit surprised to see that mine were the only hand made gifts (for this one my gift was an afghan, the green knit bunny toy, a pair of high-tops tennis shoes (crocheted by a friend), 2 pairs of booties and a hat (plus a few toys). Got the other baby gifts mailed to Ohio on Friday, so now I’m happily BABY-KNITTING FREE! (at least, for showers, anyway -still doing the newborn & premie hats for the hospital). This week is going to be another ‘almost every day something going’ week. Tonight starts DRIVERS ED for my youngest (6-8 p.m.). So far he hasn’t asked to go out practicing (since his one & only try last week – not sure why). I don’t think I traumatized him too much – I didn’t even YELL! Oh well, we’ll see what today brings – he might change his mind before this evening. Tomorrow is Ladies’ Bible Study 10 a.m., then Knit/Movie night in the evening (husband is going to drive son to Drivers Ed & pick him up). Weds. is my husband’s Oral Surgeon appointment & speciall needs group, Thurs babysit grandson & Dr. Ed, Friday, so far is open BUT two of my lady friends have asked if we could all go out to lunch together, so it looks like that’s my only free day! The Drivers Ed thing is every Mon-Thurs 6-8 p.m. for three weeks, so I’ll be booked up doing that most of the time. Finally got the laundry and dishes caught up – do you ever have it where you just don’t feel like doing the household chores? I’m horrible with that – don’t mind doing laundry, it’s the carrying upstairs of the loaded clean clothes baskets I don’t want to do (or then, fold everything – I procrastinate!) Who would have thought? “Back in the Day” (read that-when I was much younger) I used to love to fold clothes! Now it’s just another chore I have to get done, so I avoid it. Getting B-A-D in my old age! Yesterday was my turn to bring Sunday School snacks and I discovered a ‘new-to-me’ place to purchase goodies – MEIJERS! Since I didn’t feel like baking (this time) I discovered Meijers bakery department and happily purchased: sugar-free lemon pound cake (already sliced! ), mini blueberry muffins, little apple turnovers AND a HUGE box of frosted cinnamon buns (they were a close ‘cousin’ to the CINNABON buns. The buns looked so good, I bought a box for us, too. Totally happy with my purchases – all that for around $12.00- not counting our box)! (the buns were $3.99, pound cake $2.99, muffins $2.99, turnovers $2.99) I usually spend around $20+ for goodies at Gordon Food Service (1 box of assorted mini muffins and a box of assorted danish). I definitely see me going to Meijers in the future for snacks! 4 small boneless skinless chicken breasts, 1 lb. circulation inside. Place packets on a baking sheet. Bake 30-35 minutes or until chicken is done. register 170 degrees F.). Allow packets to cool 5 minutes. in nuts, cherries, coconut & chocolate chips. In a deep saucepan, brown pork in a little oil. Mix all ingredients well, using elec. mixer. Prepare brownies as directed on box. bake. Remove from oven; cool 5 minutes. Cover top of brownies with baking chips. & removing from baking sheet. 8 chicken bouillon cubes (or 8 tsp. with foil. Bake in center of oven 1 hour. fillets. Dot with butter & sprinkle with cheese. rectangular baking pan; set aside. baking powder, baking soda, vanilla & salt. Beat about 1 minute more or until combined. jam in 8-10 mounds on top of batter in pan. Have you started thinking about/preparing for Easter yet? I guess I’ve been (mentally) procrastinating about Easter dinner. Yes, I’m aware it’s coming up quickly – we get reminded in choir about how many more practices there are before the Easter Contata, but I guess I really hadn’t thought about EASTER DINNER until last night. I vaguely remember last year telling my family that I WASN’T going to do a big DINNER Easter afternoon or evening. Perhaps I should preface this with: the Saturday before I have/ and will be at church for a good 3 hours cutting up fruit and putting it on skewers, decorating tables, putting flowers in vases, etc. Our church puts on a HUGE Easter breakfast before the church service (my Sunday School class does all the preparation): tons of foods-scrambled eggs, sausages, bacon, sliced ham, a variety of egg casseroles, pancakes, biscuits & gravy, and cut up fruits on skewers, plus juices/milk/coffee,tea, bottled water. Easter Sunday I will be assisting in the kitchen for the Easter breakfast (8:30 a.m., but I will get there around 7 a.m.) then grabbing a quick bite to eat and running to the choir room before we sing the contata – lots of energy needed and NONE for getting together a very big dinner for my family! (Yes, I ‘should’ feel a little guilty, but hey – it’s what I do at this time of year!) After thinking over last year, I remember telling my family “Let’s pick another day and do dinner then!” (think we did dinner on Tuesday following Easter – it gave me time to rest up a bit and prepare a nice dinner – the way it ‘should’ be!) I’m going to go with that thought THIS year. Don’t know, yet, whether we’ll do ham or maybe turkey – I have both in the freezer. It’s a good thing I still have time to plan this out! How’s your weather? Have you seen any new flower bulb shoots popping out of the ground? I haven’t been out in our back yard to check but I’m guessing there will probably be some hyacinth and crocus shoots, maybe daffodils – who knows? It’s been so warm that almost all of our snow/ice build-up has melted (YAY!) Our dirt road going to our church was almost a SWAMP yesterday – rivulets of water running across the VERY muddy and VERY potholed dirt road – made me want a SUV or all-terrain vehicle to traverse it! Pastor said he’s going to call the county today and see if they will come grade it – he said they’re pretty good about responding when he calls (there’s also a subdivision behind and beyond our church, so they would greatly benefit from the grading, too. I don’t remember seeing potholes THAT big in years past). Well, friends, I think I’ve about exhausted all avenues of thought for today – have a great day and remember to ENJOY it! Here are some of the photos from the “Dinner with the President” event (the one we had to miss due to illness). I thought you might like to see some of the period dress. First Baptist Church of Vasser, Mich. They both love antiques and did a wonderful job of decorating (I didn’t include all of the photos I was sent, but there were LOTS of great antique ‘fainting’ couches, sofas, upholstered chairs, tables, lots of oil lamps, etc.). I was quite surprised at just how many people came in period costumes – I’d say at least half of the group (which, from looking at the photos, was around 75-100 people!). Sorry we weren’t able to go, but was really happy when Robin sent me the photos. 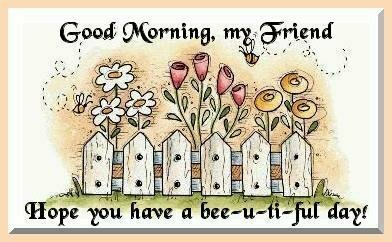 Enjoy your day, it’s 32 degrees F. and snowing! PS: For those of you who might not have read the other blog entry about the above event – the President & Mrs. Lincoln are the actual portrayers who work at the Abraham Lincoln Memorial Museum in Springfield, Illinois!